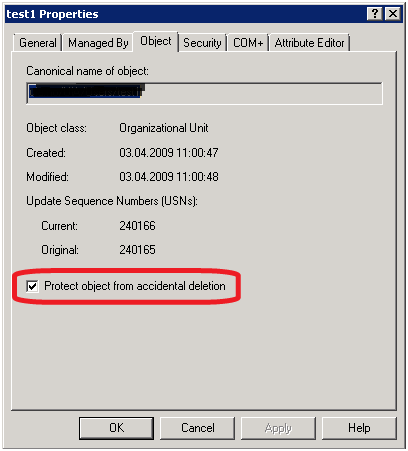 What does the Protect object from accidental deletion setting in Windows Server 2008 Active Directory actually do? This was implemented to avoid accidentally deleting objects from the directory. OUs have this setting set by default. But what does it actually do? When this setting is set a Deny access control entry (ACE) is added to the security descriptor of the object (“DELETE” & “DELETE TREE”) and a Deny access control entry (ACE) is added to the security descriptor of the PARENT of the object (“DELETE CHILD”). The security principal associated with these ACEs is Everyone, and they apply to This object only. The UsersOU itself will get the “DELETE” and “DELETE TREE” DENY ACE set. The parent of Users, in this case the OU Unit, will get the “DELETE CHILD” DENY ACE set. If your are still running Windows 2000 or Windows Server 2003, I highly recommend making this part of your standard steps for creating new OUs. You can also change the Active Directory Schema so that the ACEs are set by default when creating new objects. When I figure out how that is done I will update this post.